Click here to watch sea otters LIVE!!! of not passing on life? The questions students might end up asking may differ slightly from those listed below. This allows the student to have a more successful learning experience from the inquiry activity. 1. Have sea otter populations changed? Are they currently increasing or decreasing in our waters? 2. 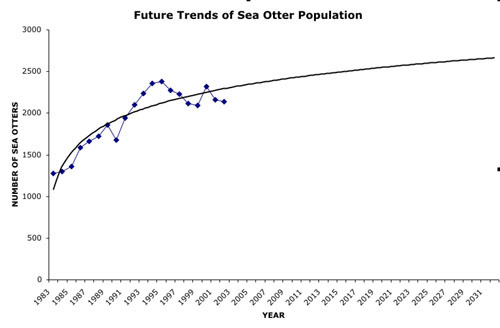 Based on your findings, what will happen to sea otter populations in the future 10, 20 and 30 years from now? 3. How do sea otter pup numbers compare to adult population numbers? What does this comparison indicate about the general population? 1. Is there a direct correlation between any event or legislation that may have affected sea otters and a change in population? 2. What could cause sea otter populations to decrease historically? What could cause them to decrease now? 3. What changes could humans make to help increase sea otter populations? 4. 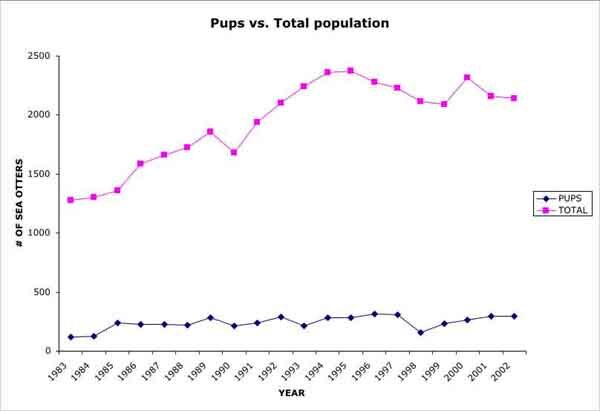 What is the significance of a decrease in only pup populations? What would an increase in pup numbers tell us? Defining Correlation: the simultaneous change in value of two numerically valued random variables or a reciporcal relationship between comparable entities. For example, a correlation exists between lung cancer and cigarette smoking. Defining Trend Line: a graphical representation of a statistical trend or pattern. For example, if deaths caused by cancer are increasing every year, there will be a positive sloped line. Students will be using numerical data. Both graphing calculators and spreadsheets may be used to scatter plot data and calculate trend lines and their equations. The example shown below uses a spreadsheet. Students will be finding sea otter numbers for a series of years and graphing this information, as well as for sea otter pup numbers. An example is provided below. They may also calculate trend lines. See Data Investigation for an example. There is often a giant leap from defining the type(s) of data desired and actually finding the data. Providing guidance to students in finding the necessary data may be necessary. www.biologicaldiviersity.org/swcbd/species/otter/otter.html - This website provides the raw data and some calculated data in a spreadsheet. It also provides graphs, however, the students will need to create their own graphs. www.seaotters.org/Otterscensus/index.cfm?DocID=31 - This website provides the same raw data and some calculated data, but no graphs. 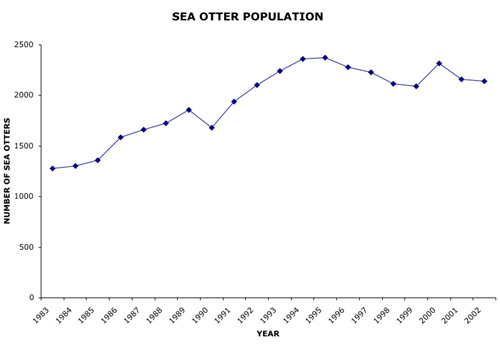 www.otterproject.org/esu_1296/02.html - This page has a written section with historical range and population data, along with causes of decreases. oceanlink.island.net/oinfo/otterpage/otter.html - This page also gives historical range and population data, along with conservation efforts. might be unaware of how data can best be manipulated, so teacher guidance may be appropriate. Entering data values in a spreadsheet by hand can be very time consuming, and can also lead to many errors. Copying and pasting raw data from a website to a spreadsheet program such as Microsoft Excel can save the student a lot of time and effort. Students will be able to focus most if not all their efforts on the actual data manipulation, which is the main objective of this inquiry assignment. In order to make is easier for the students to manipulate the data, it is a good idea to copy and paste the values of interest into another spreadsheet or even to a different location on the spreadsheet. When constructing graphs, it is critical that the data values of interest are in the same vicinity in the spreadsheet. 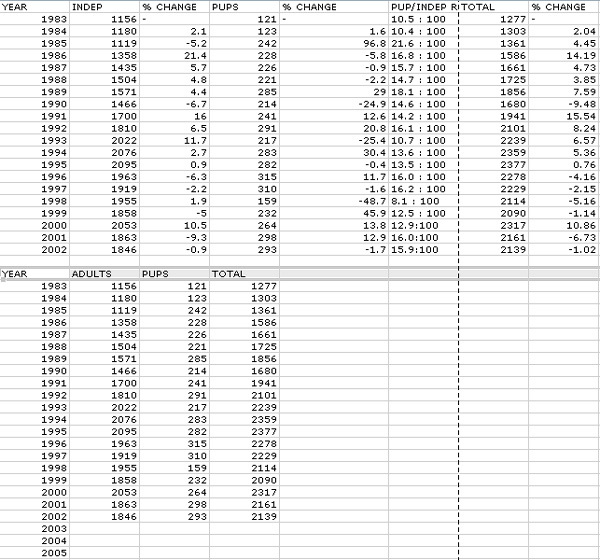 This is shown in the spreadsheet example shown above. 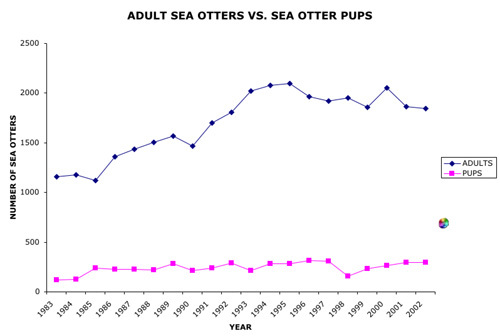 between the year 1983 and 2002.
and sea otter pup populations differ over the years. Trendline...". Choose "Logarithmic" as the Type of trendline used. No result is meaningful unless communicated appropriately. Discussion of findings should be supported. There may or may not be definitive answers to the questions students raised. 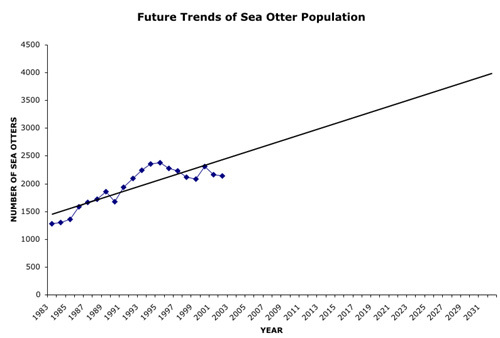 In the first example, students will be able to see that total sea otter populations were at an all time low in 1991 and at an all time high in 1995. The graph also shows that from 1996 to 1999, there was a slight decrease each consecutive year. 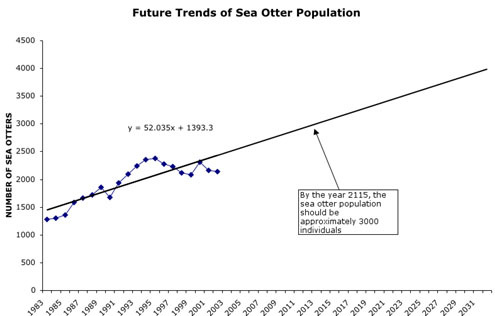 But, despite all of this, it is safe to conclude that overall, the total sea otter population has increased over the 10 year span shown in the graph. In the next two examples, students will be able to see how sea otter populations compare to the total population and to the adult sea otter population. They will be able to conclude that sea otter pup populations have stayed pretty much the same over the years and that the number has always been lower than adult sea otter populations and the total sea otter population each year. Finally, in the last example, students will be able to manipulate the raw data to make predictions about future sea otter population numbers. By using the equation, students will also have the opportunity to calculate those numbers. Presenting relevant data is essential to communicating scientific knowledge. Here is a way for students to present what they have learned. or social action could stem from this project? 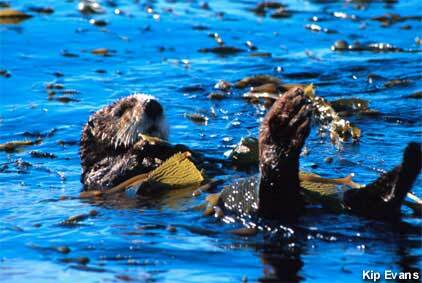 Do you think the trend you find in sea otters is typical of other marine animals in our area? Which ones? If you researched another marine animal, what would their population graphs look like? Do you think sea otters will go extinct in California? Is this representative of what is happening in the world? What can you (I) or we do to help sea otter populations continue to grow? Why should they continue to grow? Who or what does that help? How is the ecosystem better (richer) with them?